Tagaytay is the usual go-to spot for families in need of relaxation. It is a haven for tired, weary souls looking for some getaway but still near the proximity of the city. The good news: we've just found a place for you and your kids--View Park Hotel. The first time I've heard of View Park hotel was when they partnered with Blogapalooza. They gave away spa massage gift certificates to lucky bloggers who attended the said event and gave away free t-shirts to attendees! 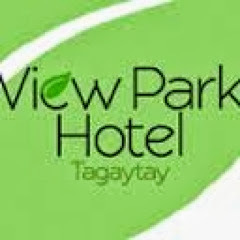 One of the most affordable yet classy hotels in the heart of the Tagaytay, View Park was ranked as one of the most recommended hotels in Tagaytay at Tripadvisor. 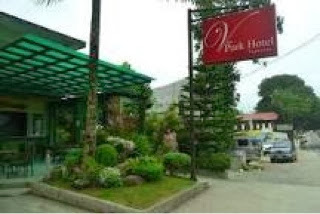 View Park Hotel is ideal for travelers who seek great ambiance, comfortable with budget-friendly rates, and accessibility to Tagaytay's tourist destinations. 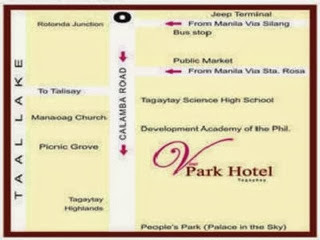 As it's quite a drive off Tagaytay's highway, View Park Hotel offers a peaceful, homey ambiance. All rooms and function areas provide space, equipment and amenities that you need either for personal or business stays. Enjoy the outdoors. View Park Hotel has a garden with gazebo. Take a dip in the pool. Kids can while away the hours in the kiddie wading pool as well. They also have ample parking space for your convenience. Spa services are also available for those looking for a spa treatments. And after all the touring and playing, your family can have a feast of the hotel's sumptuous dishes at the Red Lemon Grill restaurant or at Adam's Cafe. View Park Hotel also offers swift and friendly service from their sincerely warm staff. For all these reasons and many more, View Park Hotel will truly make your Tagaytay stay even more memorable. Philpop 2014 Song Writing Competition is on! © Purple Plum Fairy 2010, 2017. Watermark theme. Powered by Blogger.